Lok-Tyle™ floor mats feature an open grid diamond pattern to allow moisture and debris to drain from the surface and maximize traction. The modular cross-hatch PVC vinyl tiles snap perfectly together on-site for custom configurations to specifically fit your facility's needs and can be reconfigured to constantly adapt to changing environments. 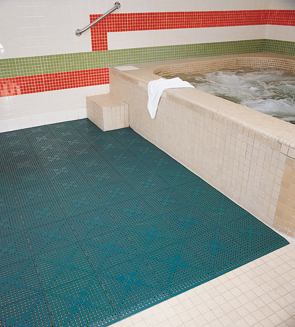 Ideal for locker rooms, shower areas, spa environments, and restaurant/bar floors. In addition, its light-weight, modular design allows for additional use as shelf liners, especially useful in food preparation areas. Raised diamonds on top surface facilitates drainage and aids traction. Light-weight, modular, drainage design allows for use as shelf liners in food prep and bar areas. Assemble the Lok-Tyle™ floor mats however you want. 12" x 12" tiles are sold individually. 2" x 12" outer edge pieces feature a slight ramp to prevent tripping and allow for wheelchair or cart access. Corner pieces are 2" x 2" and also have a slight ramp. All pieces connect together to fit any space.